Situated in Fort Kochi, Fort Manor is within a 5-minute walk of the Chinese fishing nets, the famous St. Francis Church and Fort Kochi Beach. Complimentary wired internet access is provided in the property’s public areas. The property is approximately a 5-minute walk from the Fort Kochi Bus Stand. 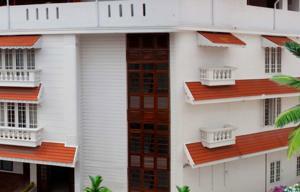 It is 15 km from the Ernakulam Railway Station and 45 km from the Cochin International Airport. Fitted with wooden flooring, air-conditioned rooms feature a flat-screen TV with cable channels and a seating area. The en suite bathroom comes with hot/cold shower facilities. Manor operates a 24-hour front desk, where its service staff can assist with luggage storage, car rental and tour arrangement services. Free parking spaces are also available. Free! One child under 5 years stays free of charge when using existing beds. One older child or adult is charged INR 1680 per night and person in an extra bed. Maximum capacity of extra beds in a room is 1. There is no capacity for cots in the room. Supplements will not be calculated automatically in the total costs and have to be paid separately in the hotel.